This adventure combines overland travel to and from the village of Willowbreak, its challenges involve both combat and role playing. It is not a traditional adventure module that consists of one dungeon or one goal, but rather consists of a series of short adventures, which in turn offer the enterprising Castle Keeper the opportunity for numerous side treks and adventures. It is easy to port into any game and sections can be played or skipped over as needed. Though set in the official Castles & Crusades world of Aihrde, and a sister book to Mortality of Green and Shades of Mist, it is a complete stand alone adventure or can be used as a series of encounters. It can be adapted to any homebrew or published setting. As with many of the adventure modules published by TLG, Upon the Powder River offers numerous, short-encounter areas. Included within are To the Damenheit Bridge, Thorns for Beer, River Walk, Golden Shingles and Breaking Heads. All roads through the Darkenfold are dangerous, and the tracks to Willowbreak are no exception. From the beginning, travelers must hazard a number of dangers, from the flooded river and submerged bridge, to lonely foot paths, ensorcelled bar keeps, giants in the water and eagles that burn. 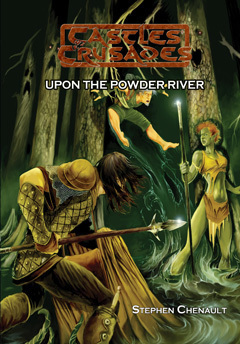 Upon the Powder River offers five loosely linked adventures that pit the characters, their wits and brawn, against a number of deadly encounters, both magical and mundane. Upon the Powder River explores the eastern reaches of the Darkenfold, from the Perth Timberland, to the Damenheit Bridge, to the town of Willowbreak and beyond to the wild and dangerous Bent's Trading Post. Upon the Powder River is an adventure for 3-5 characters of around 4th to 7th level.